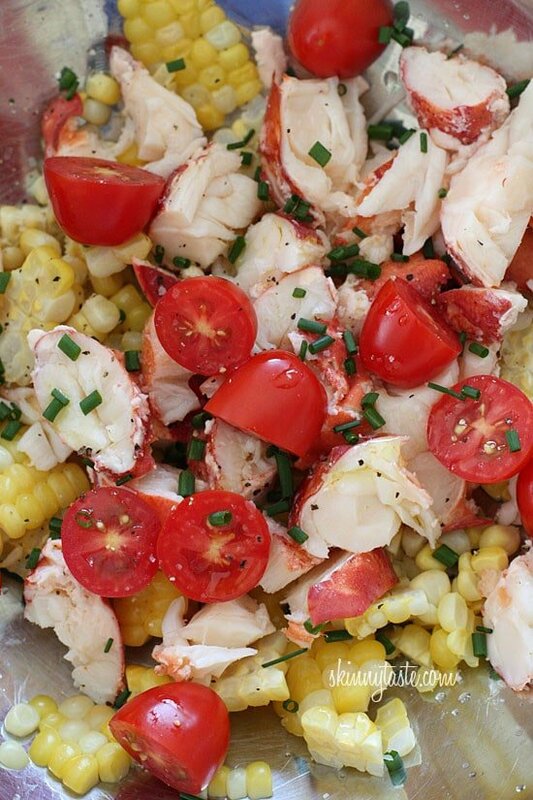 Chilled Lobster Salad with Sweet Summer Corn and Tomatoes, the perfect light summer salad made with sweet summer corn, grape tomatoes, garden herbs and chilled steamed lobster. 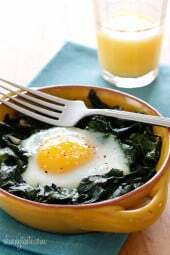 Serve this for two as a main dish salad or for four as a first course as pictured here. Nothing beats a refreshing lobster dish in the summer. 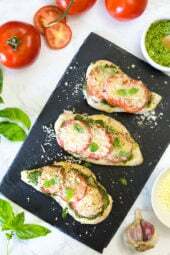 Some of my other favorites are Grilled Lobster Tails with Herb Garlic Butter, Lobster Tacos, and Lobster Salad. August is a great time to buy lobster here on Long Island, I can usually get great specials from my local Lobster farm. And the best part about buying my lobster from a lobster farm is that they also steam it for me at no extra cost. It’s not that I can’t cook my own lobster, it’s just that if given the choice, I’d rather not. 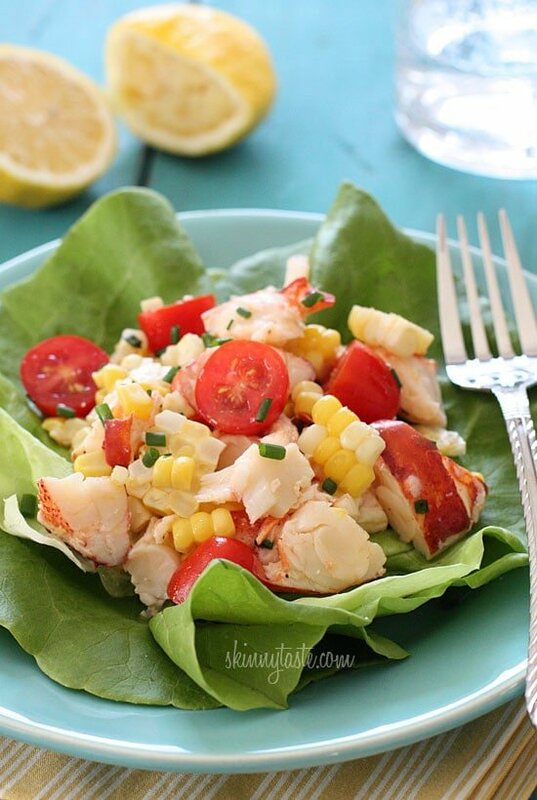 If you don’t live near the coast and don’t have access to live lobster, you could use lump crab meat, cooked shrimp or even imitation crab instead. 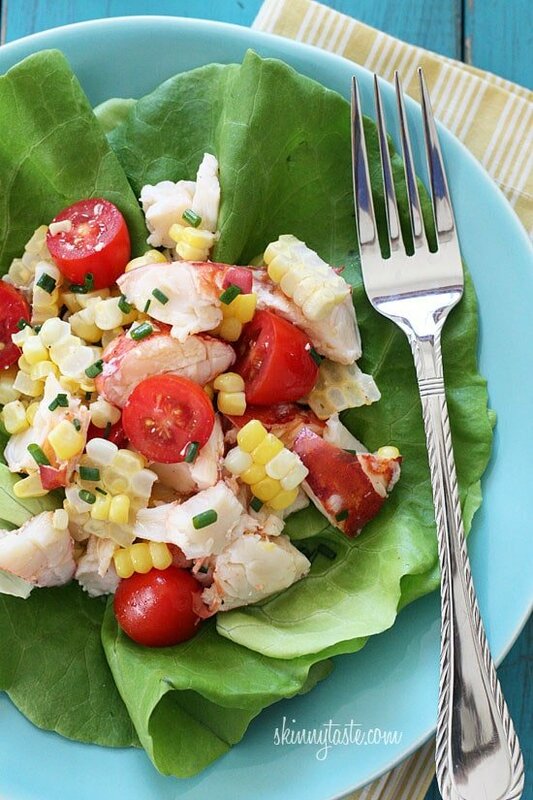 Chilled Lobster Salad with Sweet Summer Corn and Tomatoes, the perfect light summer salad made with sweet summer corn, grape tomatoes, garden herbs and chilled steamed lobster. Cook corn in boiling water for about 4-5 minutes; set aside to cool. Cut kernels of the husk and place in a large bowl. Chop chilled lobster meat from tails and claws into large bite sized chunks; add to the bowl. Add tomatoes, chives, lemon juice, olive oil, and salt and fresh cracked pepper to taste; toss to combine. 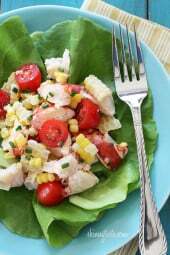 Place lettuce leaves on two plates. Top each plate with lobster salad and enjoy! did it just like you said… except no lettuce.. (ate the tomalley on the side). SO GOOD. SO FAST. SO EASY! thanks! I didn’t have any lemons but had tons of limes, used lime juice, added some cilantro and avocado and it was delicious!!!!!! This is fabulous. I almost licked the bowl. Thank you Gina. 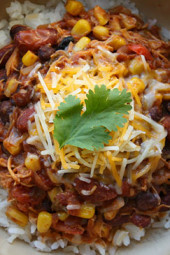 Your recipes are keeping me on the Weight Watcher track with a weight loss of 22 pounds and counting. I always look forward to the next week’s menus. Don't cook the corn. Slice it raw right off the cob …it has more flavor!!! Looks great! Curious where the 668mg of sodium is coming from. This looks so good I keep staring at it hoping it'll materialize. Hi Gina! Just came across this… If I was to prepare this in advance (10 hours, or even the night before), would you suggest I mix everything but the oil and lemon and add those just before serving? Thanks – all your recipes are fabulous! I saved this recipe in my favourites over a year ago and just made it tonight. I live in Atlantic Canada, so the lobster is plenty and very inexpensive right now. Even though the corn was imported, this was quite possibly the best tasting food I've ever enjoyed. Thanks so much for sharing! Looks so light and refreshing! Can't wait to try this as a side dish or a light lunch! Another delicious recipe, thanks! I have been using recipes from your site for months and I almost always get asked for the recipe! My husband doesn't like cold salads so I put his bowl in the microwave for 2 minutes and he said it was really good that way. I didn't have a lemon so I used the juice of 1 lime instead, and it tasted great! I just made this and it is delicious! I subbed the lobster with shrimp and added cilantro. I will make this again! I live in farm country and love it when corn is ready in the markets. 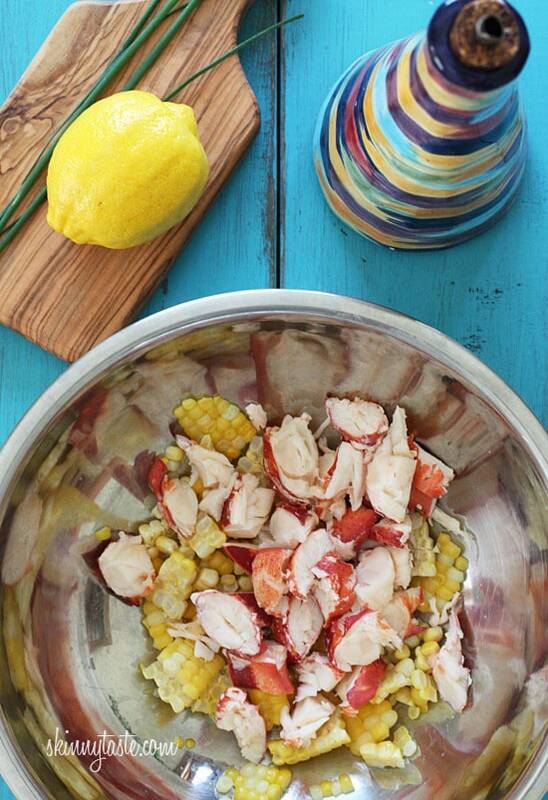 Fresh corn and lobster – sounds fantastic! I made this recipe last night for our dinner. I used cooked shrimp in place of the lobster. I did not have any chives so I used a bit of diced up green onion tops. It was so refreshing on a summer evening. My husband and I both enjoyed it. I'd like to have this for lunch today, but sadly we do not have good, cheap fresh lobster here in San Diego. Looks like I'll have to come back to the East Coast! Call me when you come back! Another winner! Happened to have 2 ears of corn, 227g pkg of imitation crab in the freezer. Got cherry tomatoes at the farmers market. Added a small slice of Vidalia onion, finely chopped, 4 mushrooms, halved and sliced and some fresh basil. Hubby called it a keeper so will surely make it again. I have been following your blog for a while and have been making the weekly menu plan 100% from your recipes. Everything turned out delicious! Thank you for your hard work and for helping me and my husband eat healthier. We are not on WW, just want to watch what we eat and have healthy tasty food on the table. One request, if possible…I have been craving for pizza lately, just can't see myself eating the delivery greasy stuff. Do you have any lighter pizza recipes, maybe with whole grain dough? I have searched your website, only saw the lavash and matzo, I'm looking something closer to the real thing with a calorie count. I love lobster and being in New England makes it so easy to get. What a great recipe! This looks delightful! Do you think fresh mint would be a good sub for the chives? I have a bunch of it growing and not sure what to do with it. I think it might! Or tarragon would be nice. I love crab just as much as lobster, so I think it would be just as good. Yum!! Here's one reason for me to have coast envy. Lobster is expensive here on the West Coast, but I love the idea of substituting crab or shrimp. Or, maybe I'll just splurge and buy some lobster. This looks amazing!! Oh Gina – this looks SO good!! Really makes me miss my days in Rhode Island. Michelle, The seafood is our biggest and best memory of Rhode Island. I used to buy the lobster off the lobster boats in Wickford. Bought the culls because of more meat. So good. Also, miss digging clams.